When you order a calling card online from Phone Card Depot you are getting the exact same card that you would if you purchased it in a convenience store or the post office. What you will receive:You will instantly receive an e-mail with a picture of the card, telephone number and your personal pin number. Sample e-mail: Below is a sample of what you will receive. Using your new card: Your card is delivered ready to use, no activation is required. 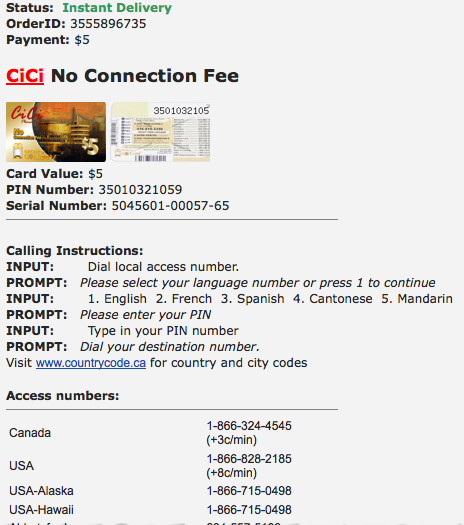 To use your card, just enter in the local access number and the PIN number that you received in the e-mail. What if you lose the e-mail: Your "My Account" panel contains a listing of your past orders and enables you to re-sent your cards to you at any time in the future. It even allows you to send a copy of the card to your cell phone. Customer Support: If you have a problem receiving your order, just e-mail support @ phonecarddepot.com. If you have a problem with the call quality or connection, please call the card manufacturer. We have included their phone number in the e-mail that was sent to you.